When I first started blogging more than a year ago, I restricted this blog to being a personal space. With time, as the recipes accumulated and started piling up, I wondered if this site should go out to all. Then, with a few of my friends approaching me for recipes that they liked of mine, I decided upon to make it public. These were recipes mostly transitioned to me by my mother or adapted from cookbooks and cookery shows, mostly jotted down in my diary. I hadn't taken blogging seriously then and never even intended to at that point in time. I barely blog hopped, forget even dropping comments. I silently continued to post recipes, with latency in posting at times. For obvious reasons, I hardly got comments. In fact none from food bloggers. And it did not make any difference. It was during these occasions when my blog was running muted, food blogger, Suma came across my site leaving a comment. An unexpected me can't possibly express how elated I felt from that comment. Hardly had I realized that my blog had opened up to readers whom I had never seen or known. With time, I realized that there was an enormous blog world outside mine, who were more enthusiastic than I was, who've spent couple of years in blogging, guys who have been rocking the blog world! That was the beginning of my 'real blogging' or must I say 'blog hopping'!!! Living in the same city, it made a difference to me knowing Suma. What began with exchange of comments, then emails and now phone calls, we seem to share common interests. We've exchanged ideas on recipes, baking thoughts, sources for uncommon ingredients, knowing interests, family... etc, etc... We haven't met up yet, possibly some day. What I shared with Suma was this healthy breakfast recipe for Granola. This Granola is loaded with nuts and we love it that way. The honey roasted oats and nuts bring out some good flavors while the nuts add a great deal of crunchiness to this recipe. There are no rules with Granola. Throw in ingredients of your choice, basically anything and everything that you like. Recipe is simple and can be stored fresh in air-tight container for weeks. Served with milk or yogurt, they are the best way to go for a healthy start to your hectic day. Preheat oven to 250 degrees F. In a large bowl, combine all the dry ingredients, except raisins. In a separate bowl, combine honey, melted butter and salt. Pour this to dry ingredients, toss to mix well. Transfer to baking tray. Cook for 40 minutes, stirring every 10-15 minutes to achieve an even color. Keep a watch. Take care not to burn them brown. Remove from oven and transfer into a large bowl. Add raisins and mix until evenly distributed. Store them in air-tight containers. What's good about Granola is that you can throw in ingredients of your choice, basically anything and everything that you like. I like to add in figs at times. Sometimes skip the butter and roast them dry. Or may be replace corn flakes with wheat flakes, they work very good too. Increase or decrease sweetness if this isn't apt to your taste. Combination of 1/4 cup dark brown sugar with 1/2 cup honey would also work fantastic. There are no hard and fast rules. You decide on what you want to throw in! With loads of nuts in them, I also love to add in fresh chopped fruits while serving. My favorite top ups are pineapples, peaches, oranges, bananas and apples. Seasonal fruits like Mangoes go well too. Serve with warm or cold milk. Try soy milk or even almond milk would be great!" And as Suma concludes, this is a delicious recipe, for a healthy breakfast which is deliciously luxurious too!!! Very nicely expressed your journey in the blog world. This story is kind of the same with most of us I guess.I started blogging in 2009 but only wrote 4 recipes and did not go public.In mid Feb 2010 I made the blog public.I did not get any response or comments from many of them for few weeks.After I sent my recipe to an event the event host left her first comment to me,that really made me happy. Even now there are days that some posts are not even seen or commented but I guess I am used to this.I sure make it a point to go and leave a nice comment on all the blogs I follow whenever I see a new recipe from them.I make sure to read the entire article. Hey Mallika.. such a sweet story.. nice to know how you starting food blogging. Wish you many long and happy times here! :) Thanks for the granola recipe. Will let you know when I try it. Cheers! Totally LOVED this write up. So from-the-heart! I saw this on Suma's blog and it was love at first sight. Now, when I see the bold and beautiful clicks again.. I want to reach out to that bottle of milk, pour it on the bowl of granola and devour! Home made granola looks really yummy and healthy recipe. Lovely clicks....have always wanting to try granols...looks too gud! Mallika, its been great knowing you!! Hope to meet up sometime soon. Your blog rocks and I am sure to be a regular here for every post!! Enjoyed reading ur post, thats a beautiful and healthy granola.. Hopped in here from Nostalgia n i am happy i did so............you have a great blog and your pictures are beautiful . Good that you came out with this blog going public .... i will be a regular visitor for sure. Lovely post! BTW, the pictures on your blog are gorgeous. Wow healthy nad delicious full of nutrition.Beautifully presented and clicked. Loved all yours photographs. Bowl of homemade granola looks awesome. Its so nice to read your story of blog word! Nice write up Mallika.. same story with most of us .. Wonderful pictures dear..loved ur recipe as well. Thanks for sharing with us too... Wish u wonderful success in upcoming days, months and yrs. I only came to know after u hopped at my place! But great to know, u ve an amazing place .... I love granola with yogurt! i can totally relate to you and i think most bloggers can..
Granola looks awesome..loved reading your post too! This is the first time I visiting your blog...And here is your post giving little description about how u started ur blog..Its really nice to have got Suma's comment...:) I am a budding food blogger and I experienced this just some days back..It feels awesome..And yes discovering thousands of ladies rowinf the same boat as mine made me more active and elated my enthusiasam to post more and more.. 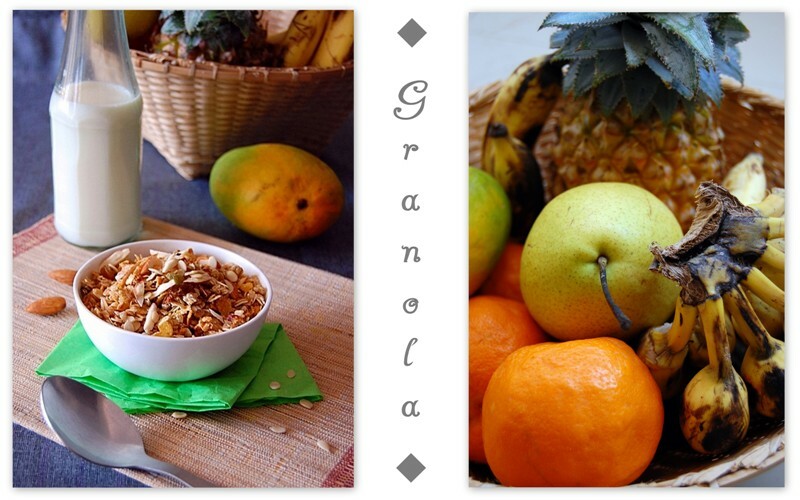 I started blog just to archive all the recipes of mine..But getting to know so many other bloggers is simpley awesome and different feeling..
Like Preety said, I can relate to what you said about blogging :) Love this granola idea.. We sometimes just add fruits/nuts to our cereal in the mornings.. But combining oats with nuts and honey and having an option to have it with yoghurt sounds great! Will definitely give this a try ..